This is a Summer School on Impedance devoted to human and robotic impedance. It has been jointly organised by the EU FP7 research projects STIFF and VIACTORS. Also check out the related EC project The Hand Embodied. Audience: Ph.D. students, postdocs, and senior researchers working on robot control, neuroscience, and biophysics. How can stiffness & elasticity enhance performance of human and robotic arms? We will address the intrinsic and controlled impedance of human and robot behaviour, and see who can learn from whom. to the 2011 STIFF/VIACTORS Summer School on Impedance. In this Summer School we combined tutorials and plenary talks on human and robotic impedance issues with in-depth scientific presentations as well as hands-on lab experience. Our Summer School was more than "just" a summer school. Apart from tutorials, we organised and encouraged scientific discussions, with afternoons characterised by in-depth scientific talks by leading researchers. 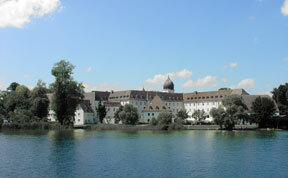 The Summer School has taken place on the picturesque island "Frauenchiemsee" in Bavaria, from July 25 to 29, 2011.